TEMPE, Ariz. -- Terry Evans' enthusiasm is visible in his eyes. "It's really the first Spring Training where I feel like I'm in the mix, competing for a [roster] spot," the Angels' outfielder said. "The last couple of years I could see what was happening. Coming into camp this year, it's a little more exciting." With Gary Matthews Jr. in New York, at least one and possibly two Halos outfield roles are available, depending on how many pitchers the team carries into the season. Evans, infielder Brandon Wood and catcher Bobby Wilson -- teammates in recent years at Triple-A Salt Lake -- are out of Minor League options, meaning the Angels must have them on the 25-man Opening Day roster or risk losing them to another club. Evans, a 28-year-old Georgian acquired in a 2006 deal with the Cardinals for Jeff Weaver, was 2-for-7 with the Angels in 2009 as a September callup. After lining out and grounding out in two at-bats on Wednesday against the Reds while playing center field, Evans is 3-for-12 (.250) this spring. 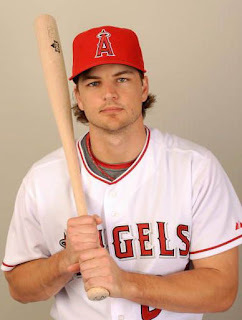 "He has the ability to play in the Major Leagues," Angels manager Mike Scioscia said. "We have some talented guys who are competing for jobs, and it will probably come down to the end of Spring Training to see where it goes." With his size (6-foot-3, 205 pounds), grace and athleticism in the outfield and his powerful stroke, Evans has drawn comparisons to Dale Murphy, the Braves star whose humility made him one of the game's most popular players. When he's locked in, Evans has been known to launch baseballs. He went deep 26 times last season in Salt Lake while driving in 90 runs, career bests in both departments. He batted .291 with a .520 slugging percentage. "Fortunately, I was able to stay healthy in a very important season," Evans said. "I pretty much missed 2008 [with shoulder injuries]. I might have come back too soon and re-injured it. Evans has the range to play center and the arm to handle right. He also has speed, having stolen 28 bases last season in 33 attempts. "Right now, my ideal situation is that I want to play here," he said. "I like the staff, everything about the organization. It is exactly where I want to be. I'm competing for a spot here. I want nothing more than to be in this clubhouse." Having played alongside Reggie Willits and seen the superb spring of Michael Ryan, another outfielder playing his way into the picture, Evans knows it won't be easy nailing down a spot. Evans also knows there figure to be a number of clubs intrigued by an athlete who can hit, run and field the way he can. "No need to worry about it," Evans said. "This is a tough club to make. It's just part of it. Reggie and I have joked around this spring. Every time he does something, he looks at me. We're having fun with it. "If anything, it makes us both better. We're competing but we're also supporting each other. That takes some of the pressure off. We're such different players, we really have different roles." Willits' skills are those of a leadoff man. He works counts, bunts, goes the other way, steals bases. Like Evans, he can play all three outfield roles. "I just want to stay healthy and keep working," Evans said. "Things always have a way of working themselves out." Race time: 1:47.17.612; Margin of victory: 7.964 seconds; Winner's average speed: 113.16 mph; Lead changes: Five different leaders, 22 lead changes; Laps led: Herrin 32, Westby 12, Eslick 5, Rapp 5 and Coghlan 3. DAYTONA BEACH -- The Daytona 200 started with a disaster Friday night -- seven motorcycles crashed on the opening lap -- and ended with defining victory for a 19-year-old rider. Josh Herrin goes into the record book as the second-youngest winner of the 200 after an overpowering ride and a couple of quick pit stops from his Team Graves Yamaha crew. "It's an awesome feeling to bag this bad boy," Herrin said. In the closing laps, it was a gut-check for the Dublin, Ga., rider, who could feel Dane Westby, also Yamaha mounted, closing in on his exhaust pipe. At one point, Westby was just 2 seconds behind the teen sensation. "I knew Westby was coming," said Herrin, who won the last four Daytona SportBike races of the 2009 season. "I just kept putting in the laps and pushing as hard as I could. Dane rode an awesome race." Herrin beat Westby by 7.964 seconds after 57 grueling laps over Daytona International Speedway's 3.51-mile motorcycle road course. Herrin led 32 laps, including the final 17, when he pulled away from his nearest challenger. Westby backed off to stay off the grass. Many other riders were not as fortunate. "I saw the gap open and close," Westby said of his attempt to catch Herrin. "I didn't want to do something stupid and throw away second place." Westby led 12 laps before settling for runner-up honors. Steve Rapp, who won the 2007 Daytona 200, was third aboard a Ducati. "We put the best effort we could," Rapp said. "It was a good effort for a two-year-old team to get to the podium. "This is the Daytona 200. How many times can you say you had a chance to win the 200? There's not many chances you get to be competitive in this race. I am happy to be on the podium." Rounding out the top five were Danny Eslick, on the No. 1 Richie Morris Racing Suzuki that started from the pole position; and Kev Coghlan, who crashed on the last lap but still finished fifth, a lap down to the top four bikes. Eslick led five of the first 19 laps but lost contact with the riders ahead of him. Herrin never felt threatened, except on his last pit stop, when the bike ahead of him on pit road had a fuel spill. "That freaked me out," he said. "They were telling me, 'Don't go through (the gas)', then (they) pushed me through it." The start of the race was pure madness. On the first lap Martin Cardenas, who was the second-fastest qualifier, dumped his No. 36 Suzuki in the east horseshoe. Seconds later, five riders crashed exiting road course Turn 1. Among those involved were Clinton Seller, Ponce Inlet's Mark Crozier, Bostjan Skubic, Russ Wikle and P.J. Jacobsen. Seller, Crozier and Wikle were treated and released from the Speedway's infield care center. Jacobsen and Skubic were transported by ambulance to Halifax Health Medical Center. Jacobsen was treated and released. Skubic was described as awake and alert. The race was red-flagged for a short time to clean up the course. The first start did not count as a lap, as there was a complete restart. On the restart of Lap 1, Josh Day spilled going into Turn 1. Before the first lap was over, Shawn Higbee had a fall in the infield course. The final chapter comes near home. How much longer Lehmon Colbert and Ben Smith are college teammates is an unknown, but if their union ends in the next few days, it will come in a city that sits between their hometowns. If not, and they win this week’s A-Sun tournament and advance to the NCAA tournament, they’ll have a terrific lifetime memory of Macon. And it’s fitting that friends and family are closer for this curtain call and get one more chance to watch them play. Jacksonville basketball fans have seen one of the program’s best duos lift the Dolphins since their arrival, when Jacksonville wasn’t on overly attractive program. The Dolphins went from 16-13 in Hugh Durham’s final season as their head coach to 1-26 in Cliff Warren’s first season. But Colbert saw promise. The two had known each other courtesy of AAU play with the Smyrna Stars, but that was for less than a year. Still, they kept in contact during the recruiting process. Colbert committed first, and that eventually swayed Smith. What was Colbert like back then? Indeed, the transition from GHSA Region 4-AA to college basketball had to be dealt with. “I had to bulk up,” Colbert said. “I was the biggest person on my team in high school. It was a lot faster, and I had to get a lot stronger. Colbert also looked at Kennesaw State, Wichita State and Northeastern. Kennesaw State was closer to home but was just starting the process of going from Division II to Division I, so Colbert would have no chance at any postseason. 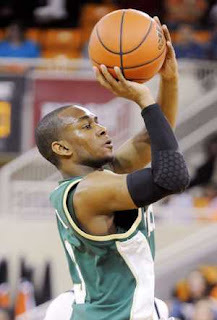 At Jacksonville, Colbert got to play in last season’s NIT, thanks to winning the A-Sun’s regular-season championship. That’s a pleasant change from the debut of Colbert and Smith at Jacksonville as the Dolphins lost to Savannah State. And they entered that Christmas break at 4-6, with the wins coming over St. Leo, Division II Florida Tech, South Carolina State and Coastal Carolina. Smith picked Jacksonville over Tulsa. Amazingly, he wasn’t highly recruited, although Georgia came in late but talked about automatically redshirting. Both Smith and Colbert saw the facts: Jacksonville was a one-win team a years earlier with youth, walk-ons and stopgap players. A good freshman would get serious minutes immediately, but Smith actually had a crisis of confidence as a freshman. The Dolphins rallied from their scary start, won seven of eight late and finished 15-14. Colbert averaged 11.7 points and 5.2 rebounds on 28.7 minutes as a freshman, and he has a career average of 12 points and six rebounds while playing 28 minutes per game. Smith enters the tournament as Jacksonville’s all-time leader in games played, minutes played, steals and made free throws, and he is second in assists (six behind the leader) and 3-point field goals. Together, they have scored 3,287 points, comprising the top scoring duo in Jacksonville history in reversing the Dolphins’ fortunes. Macon has been good to Smith as a senior basketball player. He scored 28 points to lead Dublin past Thomasville 96-84 in the AA title game at the Macon Coliseum on, yes, March 4 back in 2006, one day short of four years before the conference tournament opener. After he was smothered by teammates on the court, he ran tearfully to the front row to hug his parents. The city has been good to both in college. Smith and Colbert are 3-1 at Mercer, winning 76-64 on Feb. 20. Regardless of their fate this week, Smith and Colbert leave Jacksonville on the opposite end of the spectrum they found it. The Dolphins have had four straight winning seasons, the second-longest such streak in program history. They are the first four-year seniors to depart Jacksonville without going through a losing season. Warren is already the fourth-winningest head coach in program history, and Jacksonville is two victories away from a 20-win season. Jacksonville is 69-52 with Colbert and Smith in uniform, and the Dolphins definitely will have support tonight when they battle North Florida. But they know the clock is ticking. “Since I’ve met Ben, he’s been that type of player,” Colbert said. “He takes the big shots; he makes the big shots. Any fan of the Olympics has had the fantasy of being a part of it. Crystal Hardy made it happen, not by training but through recycling. 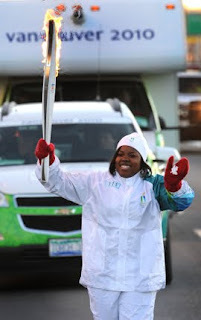 Hardy, 20, was chosen by Coca-Cola's Positive Living initiative to be one of 20 young people selected as official Olympic Torchbearers, thanks to her work in the green arena. After seeing an announcement that applications were being accepted for the program, Hardy reached out to her former Girl Scouts leader and asked for a recommendation. Within three days, the forms were signed sealed and delivered and within a month Hardy got the call she was waiting for; she had been accepted. Hardy, now a student at Georgia Southern University, co-founded Laurens County Green Teens as a high school student. The program encourages every middle and high school in the county to collect PET 1 bottles, which were then donated to a local business that recycled them into carpeting. The school programs, headed up by two student leaders from each school, earned money on a pound-per-pound basis to help fund school programs. The group also went from school to school, educating students on the importance of recycling, which items Laurens County, GA collected and how and where to recycle each item. When Hardy wasn't talking recycling, she was volunteering. 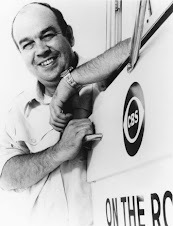 Hardy, who grew up in Dublin, GA, organized the Playground for W.I.N.G.S. Project, dedicated to building a playground at a local women's shelter. Crystal obtained all materials and managed 150 volunteers. Coca-Cola was impressed enough to offer her a spot as one of several Torchbearers who would carry the flame through Calgary. Hardy was overjoyed. "I received a phone call one morning and they told me it was Coca-Cola [calling] and as soon as they said that I knew what it had to be because I won," she said, her voice as excited as if it happened yesterday. "I couldn't think of any other reason why they'd be calling. It was so exciting." After being chosen, Hardy was sent a list of the other winners as well as several packages of gifts and information. In January Hardy and Peggy Green, the Girl Scouts leader from Laurens County who nominated Hardy, were whisked off to Canada compliments of Coca-Cola. Hardy's mother and a friend also joined them. Hardy arrived a day before her big run, which wasn't actually that big. At only 300 meters, no training was involved for Hardy. She did, however, pump some iron to prepare for the big day, which happened on January 18th. "I had to make sure I could lift the torch and just make sure I didn't pass out," she said with a laugh. "I exercise anyway on a daily basis anyway, but I did have to lift some weights. The torch weighed about four pounds but I don't have much upper body strength so I did have to make sure I could hold it for that amount of time. But it was fine. And I switched hands so that I could wave at everyone." Hardy says the excited started to build as soon as she was dropped off at the point where she would collect the flame from the previous runner. Wearing her official Torchbearer uniform and holding a torch, passersby soon realized that they were in the presence of someone special. "There were a few people at my point when I arrived but then people started gathering around, taking pictures, asking me where I was from and how I got chosen and what this meant to me," she said. "When the time came for me to run, a police officer came and pulled me into the middle of the road and he turned on the gas canister on my torch, pointed out where the [television] cameras were and reminded me that I had to run in the middle of the road and to enjoy myself and take my time. And that was it." Once the run was over, Hardy celebrated along with the rest of Calgary at the city's celebration, which coincided with the torch leaving the city. "I actually still had my uniform on and was holding my torch so I stood around for about an hour taking pictures with a lot of the citizens of Calgary just because they were so excited and elated," she said. "I don't know how to describe it. It was like everyone was unified just to see the torch and when they found out that was one of the torches that had been run that day, everyone wanted to take pictures and ask questions about how I got chosen and how it felt. "It was a spirit of unity among everyone that ran as well as all of the residents of Calgary," she continued. "The [final Calgary] torch came through down the middle of the road. There was snow on the ground and everyone was standing back on the sidewalks. When the last person came through with the torch they ran it into the middle of the crowd. There was music playing, they sang [the Canadian] National Anthem. There were lots of little venues there and places to play games. It was just a gathering to celebrate the honor and privilege of having the flame coming through the city." Her friend and mentor, Peggy Green, thinks that Hardy very much deserved the honor. "She deserved to participate in the Olympic Torch run due to her many accomplishments, including earning her Girl Scout Gold Award, planning and building a playground at a local women shelter and starting a countywide recycling program that not only recycles but also pays money to the local schools for the bottles turned in," Green said. "She also worked with young students, tutoring them, at the local Communities in Schools. These are but a few of her biggest accomplishments. She did all of these before the age of nineteen. Crystal also received the highest monetary award from Coke as a scholarship. She is part of the recycle team at Georgia Southern University, and is a member Oxfam International." Being part of the longest torch relay in history--the torch traveled nearly 28,000 miles, zig zagging through Canada in the hands of 12,000 Torchbearers--has made Hardy a serious Olympic fan. "[Before the run] I wasn't as big of a fan as I am now," she said. "I guess you can say that I am a much bigger fan now and I feel so much more connected to it than ever before and I hope that everyone who knows my story feels more connected to it as well." With the Olympic run behind her, the flame is not out on Hardy's sustainability efforts. She is currently volunteering with the Environmental Sustainability Office on campus and directing her attention on promoting recycling after football games. She is also part of a team that has made Georgia Southern University the first university in the state to exclusively use compact florescent light bulbs. With a double major in American Sign Language Interpretation and Math, Hardy doesn't see herself working professionally in the green arena but knows it will remain a passion. "I will continue in my sustainability efforts just because sustainability should be something everybody does on a daily basis," she said. "It shouldn't be something that you even have to think about. And hopefully I have a bigger role to play in it as far as educating others."